Use wine glasses for more than just drinking with. Whether you are having a wine themed wedding, or just looking for different options for centerpieces, there are many cute and unique ways to use wine glasses as part of your centerpiece. 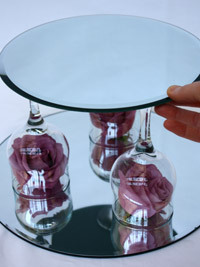 Turn the glasses upside down; the bottom can be used as a candle holder, while the cup can be used as a dome for the flowers. 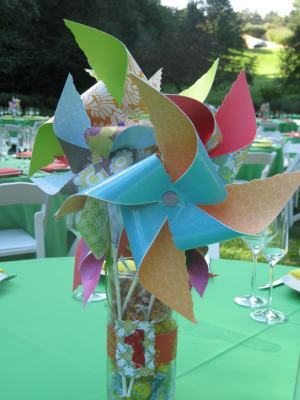 You can even use crepe paper flowers, silk flowers, fruit, or veggies in the dome for something different. 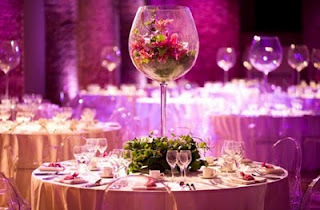 These giant wine glasses make an awesome focal point for your table centerpiece. The glasses can be filled with anything from flowers, to beda/goldfish, to marbles, etc. 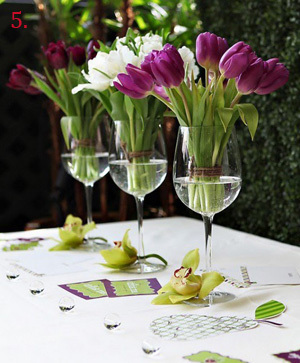 Ok, this is obviously a martini glass, but the same idea can be used with wine glasses (big or small) as well; feathers cam be used to create a “pop of color” and are more “wallet friendly” than flowers. 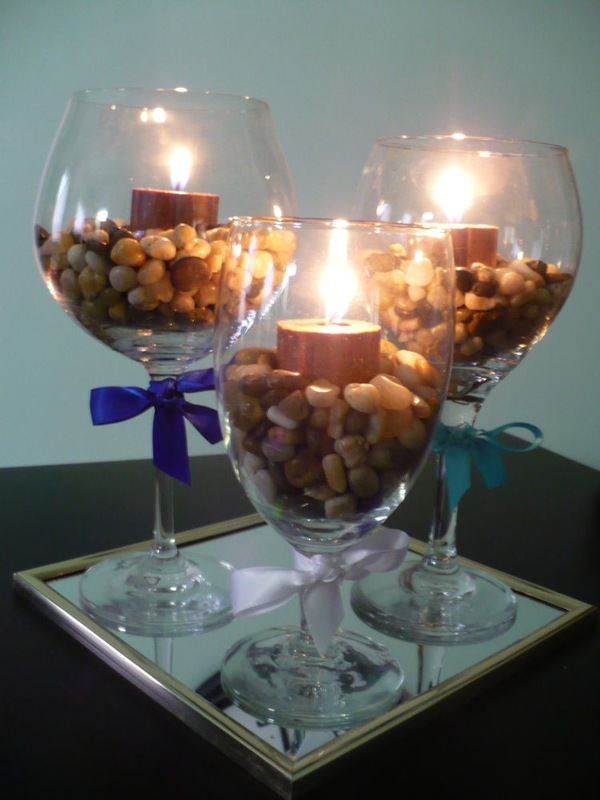 Fill glasses with rocks, stones, pebbles, or marbles and candles, tie the stem with a ribbon, and place on a glass/mirror plate; this sure beats a votive candle holder. Dress the glasses to set the bride and groom’s table apart. Make a stand by using upside down wine glasses between two plates, pieces of glass, or mirrors. 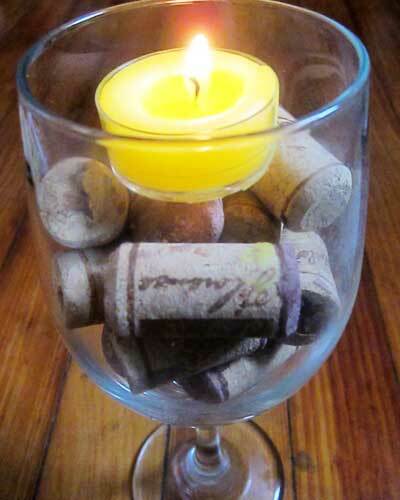 Fill the glass with recycled corks from wine bottles. How beautiful are these tulips? 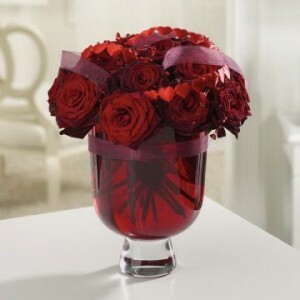 Wrapping the flowers like a bouquet will help the flowers to stand up in the glass better. 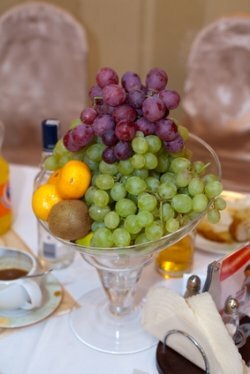 Place fruit in wine glasses; this would look nice paired with candles and larger flower vases. Use ribbons with your wedding colors to make a unique one-of-a-kind decorative centerpiece. 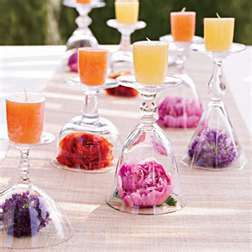 Colored wine glasses make cute napkin holders and rich colored stones are a beautiful way to incorporate color as well. 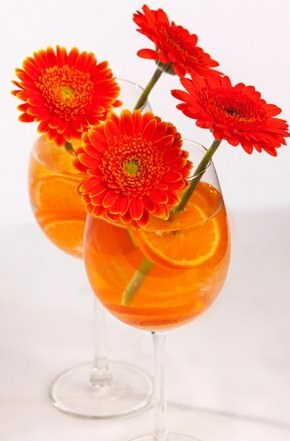 Instead of a vase, use wine glasses along with slices of fruit in the water for your flowers. This is too cute for a beach wedding. 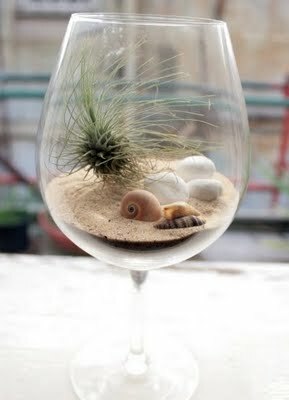 Fill the glass with sand and seashells; this is another great way to save money as opposed to using flowers! 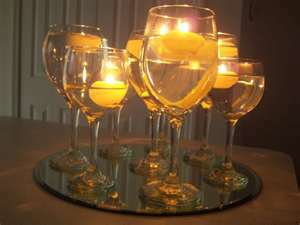 Fill the glasses with water or colored water and place floating candles inside; this makes another great candle holder! 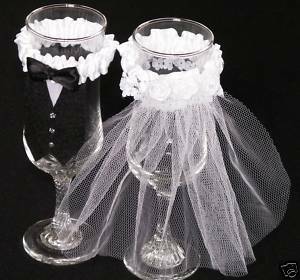 There are a lot of cute centerpieces that can be made with wine glasses and they are great alternatives to vases and votive candle holders. 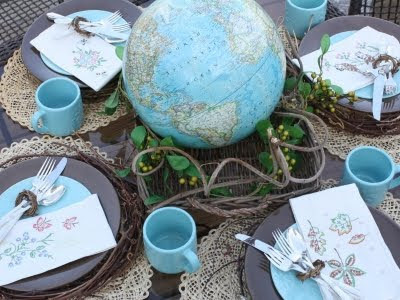 Make your tables stand out with unique centerpieces. Sure, regular flower bouquets are beautiful, but that look has been overdone. There are plenty of creative ways to bypass traditional wedding decor and make your tables unique, bold, and beautiful. 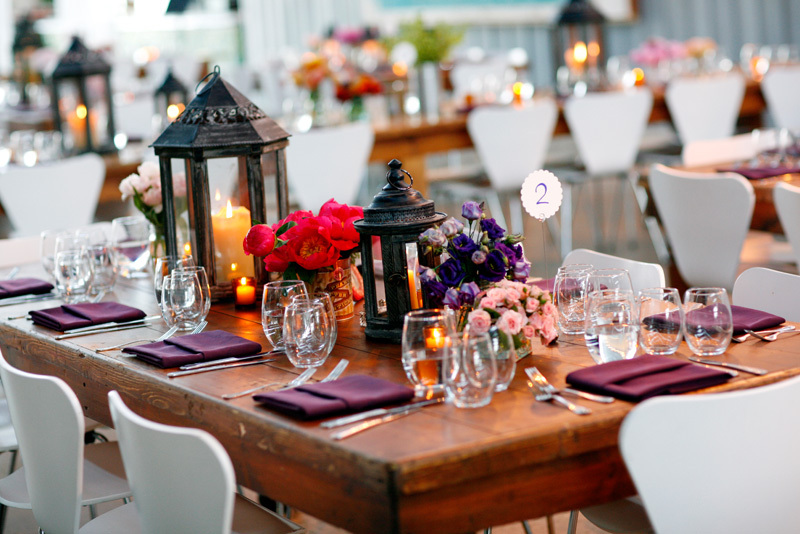 Use lanterns as the main focal point of your table; they will light up the table and be a charming alternative to large flower centerpieces. 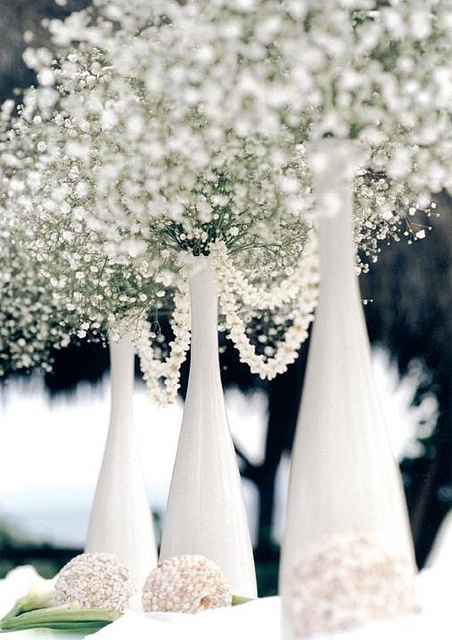 Baby’s breath can be gorgeous by itself; you can add beads/pearls to spruce up the look. Consider using bright citrus fruits (i.e. lemons, limes, oranges, blood oranges, grapefruit) to brighten up your centerpiece. 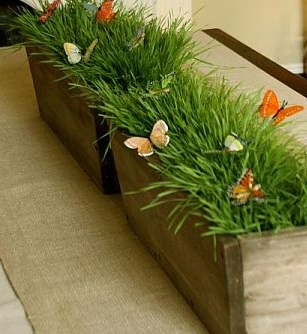 Try using grass for a simple and easy-to-manage centerpiece; the added butterfly embellishments are a super cute idea for an outdoor wedding. 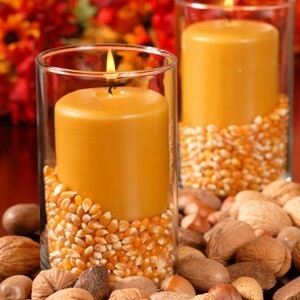 Corn kernels and nuts are festive for a fall wedding and would look fantastic paired with pumpkins/squashes, brown branches/sticks, or white, orange, or yellow flowers. 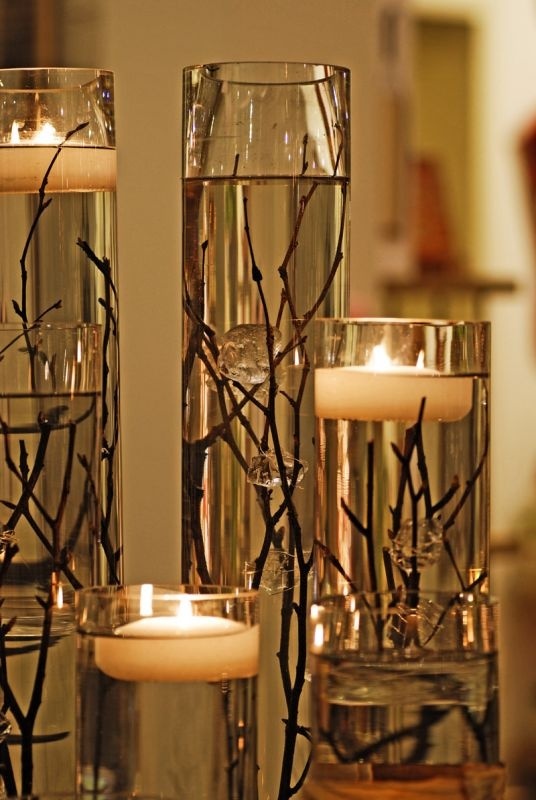 Floating candles look beautiful and elegant in glass vases; the vases can be filled with anything from wood branches, petals, flowers, stones, or seashells. 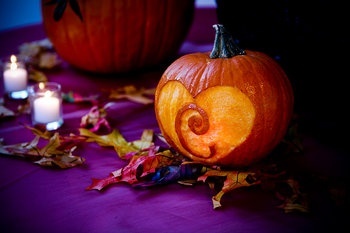 Whether carved as seen above, hollowed out and carved with a light inside, or plain, pumpkins would look darling for a fall wedding. Even fruit (real or fake) in vases can look magnificent as well. 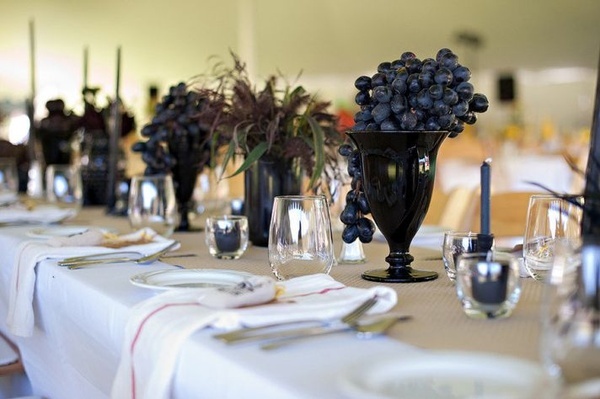 The grapes would be perfect for a wine vineyard theme wedding. 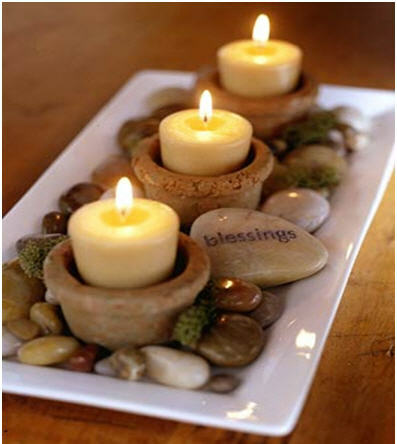 Rocks, stones, pebbles, or marbles can be used around candles, in the bottom of vases, or set on the table around the centerpiece. 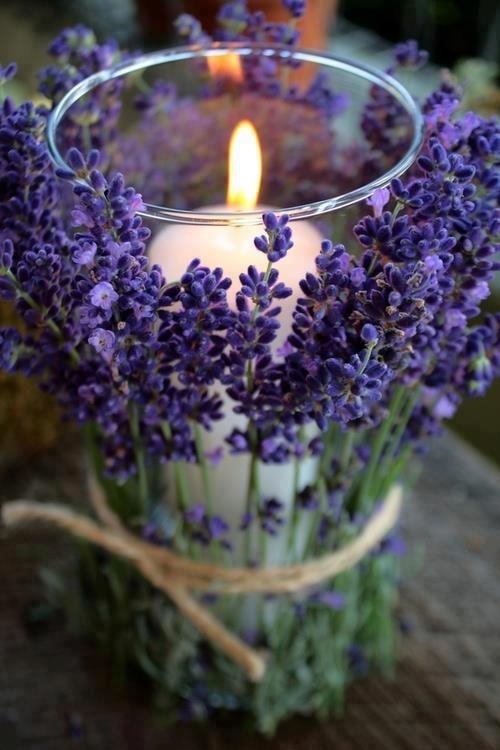 Lavender is not only pretty, but it has an alluring aroma as well. 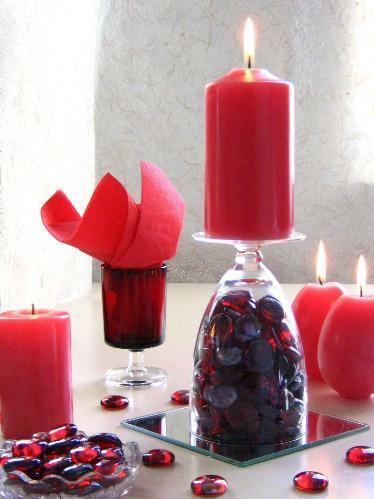 It can be wrapped around votive candleholders and used in your floral arrangement as well. 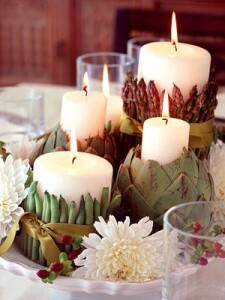 For a earthy and eco-friendly look, use veggies as candle holders. 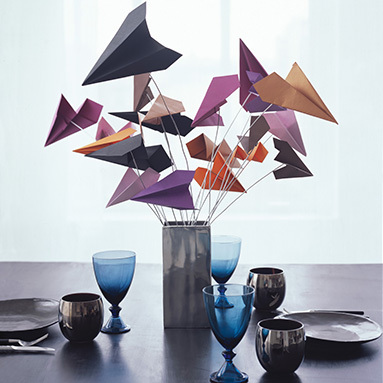 If you are looking for a wallet friendly alternative to flowers, making centerpieces out of things like paper airplanes, pinwheels, origami, etc. can look super cute for a casual wedding. 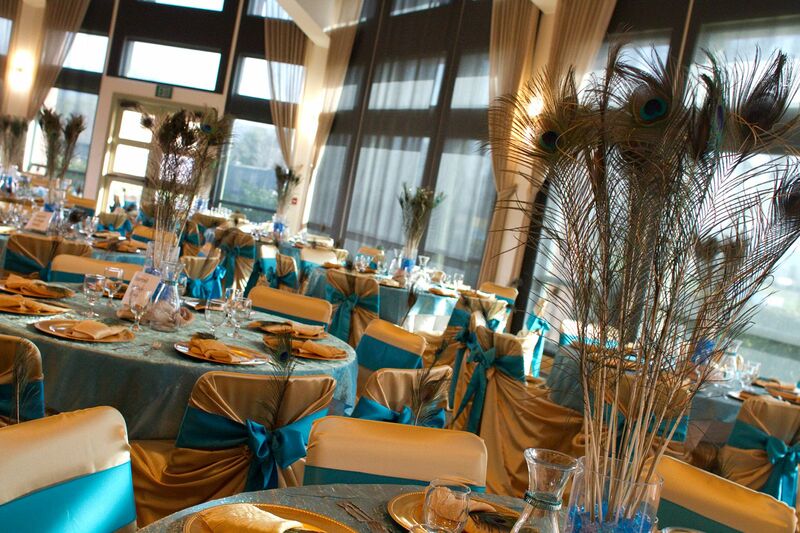 Feathers seem to be a recent hit among brides planning their wedding. Large feathers can look beautiful alone or mixed with flowers as well. 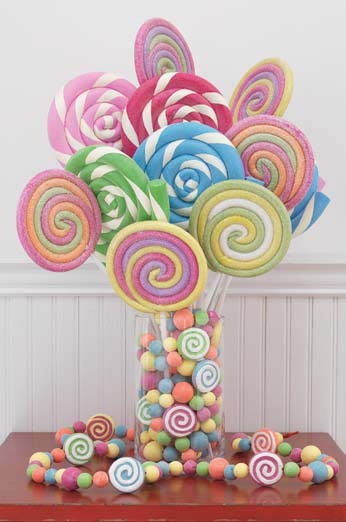 Candy like lollipops, candy canes, and jellybeans are colorful and cute for an unconventional centerpiece, and the best part is that it is eatable! 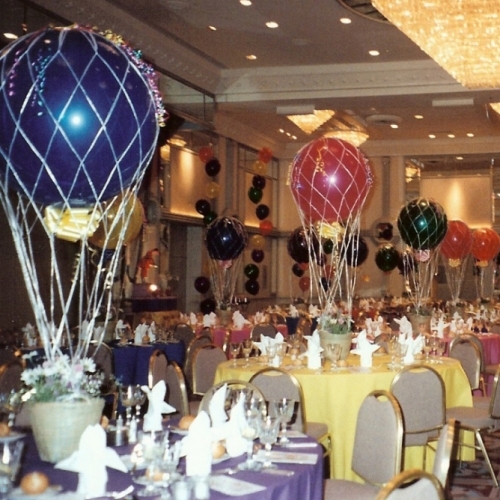 For the couple who loves to travel or the couple who is looking for something completely different, using items like a globe, flags, or hot air balloons would be the perfect match! 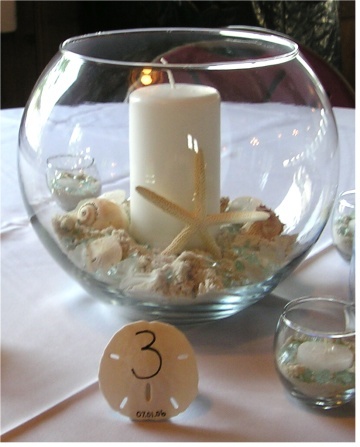 Filling vases with sand and seashells is prefect for a beach wedding. Especially love the table number written on the sand dollar as well! 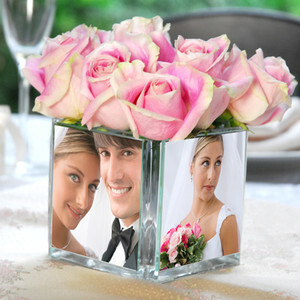 Put pictures on or around the vase for guests to see. This could be pictures from your engagement shoot, pictures of you and your soon-to-be-husband doing your favorite things, pictures throughout your dating, or pictures from when you two were kids until now. 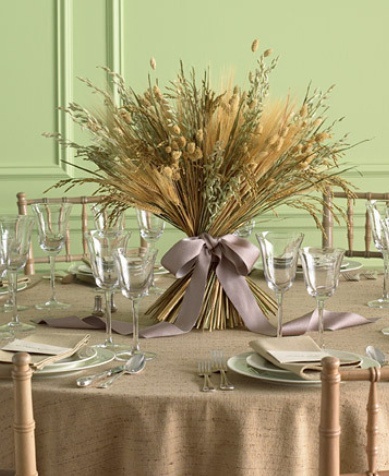 Wheat can look really nice with flowers; it looks great for an earthy backyard theme wedding. 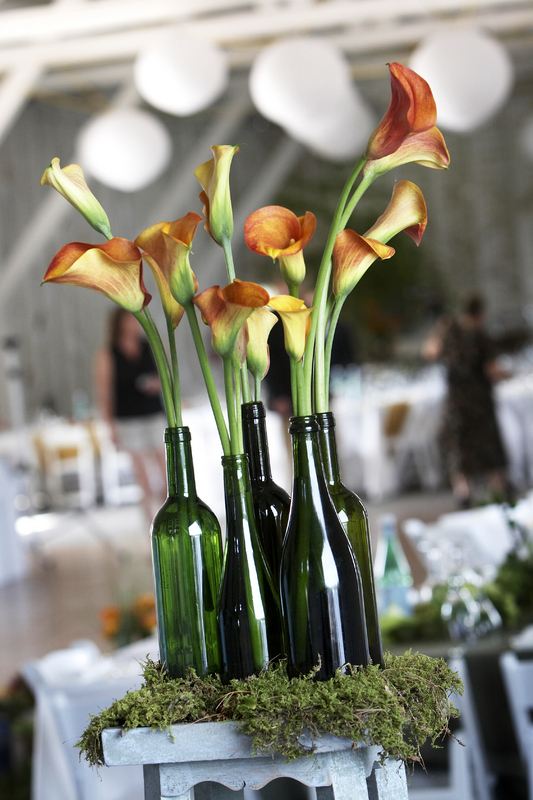 Use wine bottle as vases. For an even more unique look, they can be painted or LED floral lights can be put in the vases to light them up. Food coloring can be used to make drab clear water into vibrant colored water. 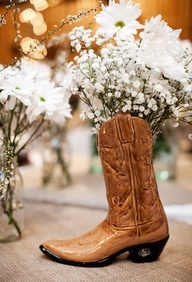 An adorable idea for a country wedding, use a cowboy boot for the vase! 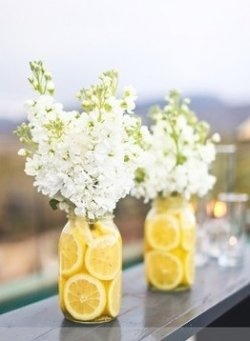 The flowers can be stuck in floral foam and placed in a boot from a goodwill or vintage store; how cute is this?! 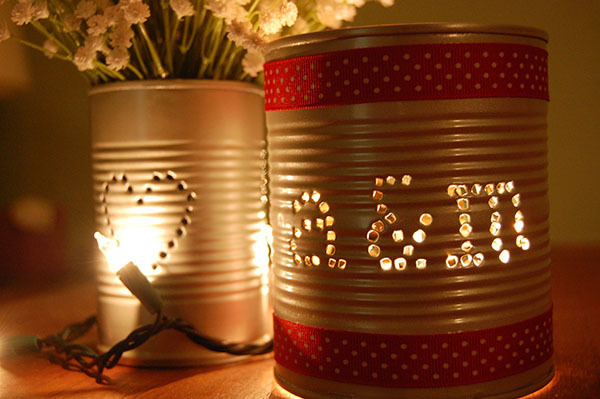 Drill or puncture holes in recycled aluminum cans and place a votive candle or flowers inside. This makes for a cheap but cute table decoration. 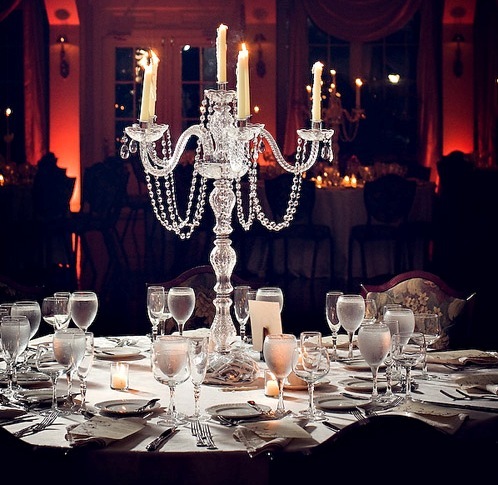 Candelabras look lovely in replacement of flowers, with a stunning centerpiece like this, who will miss the flowers? 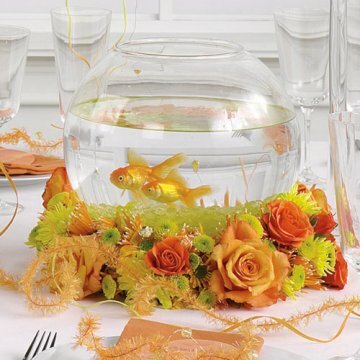 Fish bowls add a special touch to the table and the fish can always be given away to kids who attend the wedding, just like winning them at the carnival! 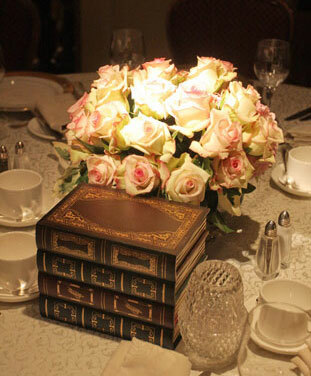 If you are a couple who shares a love for reading, old books make an exquisite centerpiece. Dress your table with a fabulous and unique centerpiece. When guests walk in the reception venue one of the first things they notice are the centerpieces, so have them swoon over one-of-a-kind table decorations.